The tuatara is a reptile which is native to New Zealand. It looks like a lizard, but it is not a lizard. 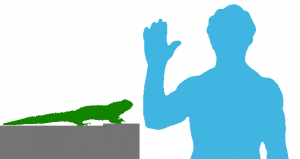 They are unique because they are the only survivor of an ancient group of reptiles that was on earth at the same time as dinosaurs. Most of them died out long long ago, leaving just a few on New Zealand. Tuataras have been called living fossils. They can live to be over 100 years old. The average lifespan is about 60 years. There are only two species of tuataras in the whole world! The Cook Strait Tuatara (scientists call it Sphenodon Punctatus) is bigger than the Brother Island Tuatara, so gets the privilege of being the world’s biggest tuatara. Tuataras survived well in New Zealand because of the cold climate. They do not survive well when the temperature goes above 28C (82F). They like it to be below 5C (41F). However, they do bask in the sun to warm their bodies. Baby tuataras hide under logs and stones. Adult tuataras are active at night and sleep during the day. They hunt at night, and eat insects ( especially wetas), worms, slugs, millipedes – and young tuataras! To avoid becoming a snack for a merciless adult tuatara, the young tuataras hide and rest at night, and only come out at daytime. Tuataras are able to survive in much lower temperatures than other reptiles. They hibernating in winter, but stay active even if the temperature drops to 5C (41F). The tuatara is most comfortable when the temperature is between 16C to 21C (61F to 70F). This is cooler than for any other reptile! The body temperature of tuatara is about 5C – 11C (41F-52F) but most reptiles have a body temperatures around 20C (68F). Tuataras have low body temperatures because they use energy very slowly. Mother tuataras lay their soft-shelled eggs once every 4 years. The eggs take 12 to 15 months to hatch. The warmer eggs tend to hatch into a male tuatara and cooler eggs will hatch into a female tuatara. Due to the global warming, the scientists predict that NZ will have lots of male tuataras instaead of female tuataras in the future. 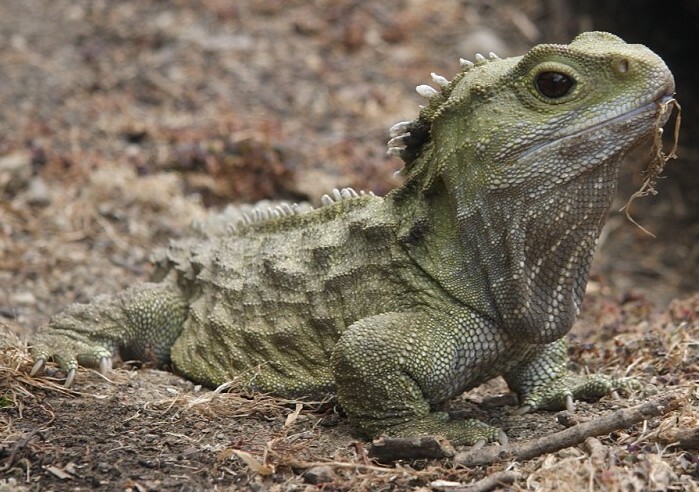 If there’s not enough female tuataras, the tuatara might go extinct! Tuataras sometimes invade a seabird’s burrow and eat up the seabird’s eggs and chicks. Sometimes they will also make burrows for themselves. Their bite can cause serious injury. Beware! Tuataras will bite when you go near them. They may not let go easily. A male tuatara can measure to about 61cm long (24 inches) and a female tuatara is about 45cm (18 inches). The San Diego Zoo has even reported tuataras growing up to 80cm (32 inches). A male tuatara weighs about 1 kg (2.2 lb) and females are about half that. A Picture of a Tuatara - Not a Lizard! Tuataras have a prominent spiny crest along the neck and down the back. That is why they are called tuatara which means peaks on the back in the Maori language. This spiny crest is used in fights with other males. The crest is triangular. Males have larger crests than female. The crest can be stiffened to make it look bigger. Tuataras have a very interesting arrangement of teeth – two rows in the upper jaw and one row on the lower jaw. The tip of the upper jaw is a bit like a beak. The bottom row fits between the two upper rows of the teeth when the mouth is shut. This arrangement of teeth is not found in any other reptile. Although snakes have double rows of teeth in their upper jaw, they are arranged differently from the tuatara’s teeth. The upper and lower jaws are joined by ligament. Tuataras chew by moving their jaw backwards and forwards as well as up and down. This helps them shear through the hard outer layers and the bone of a victim with their strong bite. Unfortunately their teeth are not replaceable. As a result of that, the older tuataras have to change their diet to softer prey like earthworms, larvae and slugs when their teeth wear down. These old tuataras will come to a point where they will have to chew their food between smooth jaw bones. So far nobody has invented false teeth for tuataras! Tuataras have 3 eyes!! The third eye is different from the others – it is small, on top of the head, under the skin in adults – it’s only visible on baby tuataras. It can’t see anything much, just tell the difference between dark and light. Although tuataras have no ear drum and no ear hole, they can still hear. There are two species of tuataras. Firstly is the Cook Strait Tuatara (scientists call it Sphenodon Punctatus). These live on Stephens Island. Their colors range from olive green through grey to dark pink or brick red. They are spotted, often with white spots, which is where they get their name Punctatus, which is Latin for “spotted”. 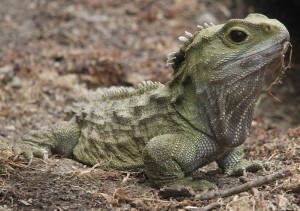 Secondly is the Brother Island Tuatara, called Sphenodon Guntheri. These are much rarer. They are found on the Brothers Island in the Cook Strait. The Cook Strait is the gap between the North Island and the South Island of New Zealand. There are fewer of these and they are smaller than the Cook Strait Tuatara. The Brother Island Tuataras have olive brown skin with yellowish patches. The map below shows the Cook Strait, from which the world’s largest tuatara gets its name. The Tuatara’s olive green and olive brown coloring helps them to match their surroundings very well. The are able to hide from predators. They can change color over their lifetime – they shed skin at least once per year as an adult and 3 to 4 times a year when they are young. Tuataras once lived on the mainland of New Zealand, but went extinct there because they have lost of their habitat and many were eaten up rats. These Pacific rats (Kiore) were brought into New Zealand by human who arrived in New Zealand about 1250-1300AD. Now, tuataras can only be found on 32 offshore islands which have no rats, in the Cook Strait and off the northeast coast of North Island. The total population of the Tuatara species and subspecies is between 60,000 to 100,000. In 2005, 70 adult tuataras were moved to the heavily fenced Karori Wildlife Santuary in Wellington to be cared for. There are several tuatara breeding programmes within New Zealand. For example, Southland Museum and Art Gallery in Invercargill was the first to have a tuatara breeding programme. They breed Sphenodon Punctatus. Hamilton Zoo and Wellington Zoo also breed tuatara and then release them into the wild when they are capable of looking after themselves.